From my point of view, Christmas and gift giving seem to be synonymous in our culture. I believe it's safe to say that it is the defining trait of Christmas. This was not always the case. This preoccupation with giving and receiving gifts within family, friends, and co-workers has evolved over the last two hundred years or so. Three streams of influence converged during this time that has resulted in the insane consumerism to which Christmas now entitles us. The emergence of Santa Claus has been instrumental to the prominence of gift giving at Christmas. This mythical figure has roots in the real person of Bishop Nicholas of fourth-century Turkey. He was canonized by the Catholic church and became particularly popular in Russia. He was known for his benevolence toward children and was depicted early on in portraits with a white beard and red cape. The Catholic Church created a holiday in his honor in December, which was occasioned by gift giving and acts of charity. As the tradition of St. Nicholas dwindled in most places it grew in Holland, where his name became Sinterklaas. Dutch children would leave their wooden shoes by the fireplace and Sinterklass would leave treats in them if they had been good. The Dutch brought the tradition to America, and as America became anglicized, so did his name. It morphed into the familiar Santa Claus. However, it wasn't until the publication of Clement C. Moore's The Night Before Christmas in 1822 that Santa took on his full form, complete with a sled and reindeer. 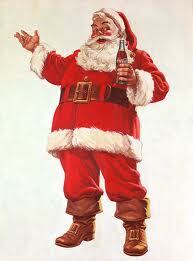 Finally, beginning in 1931,Coca-cola capitalized on the growing popularity and solidified the image of the jolly fat man in the red suit into the American mind. I admit this is a brief and oversimplified version of the Santa, but I think it conveys the main movements of the story. A second major influence on gift giving and Christmas the way we know it came from nineteenth-century Victorian England. Americans were enamoured with Queen Victoria and her royal "pop" culture. She married Albert of Germany. 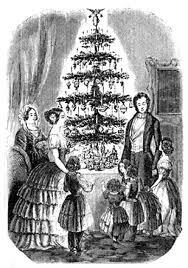 The Christmas tree was a popular tradition in Germany that had come to be associated with Christmas celebration. When Victoria erected a tree in the royal palace a new English tradition was born. Quickly Christmas trees became the holiday rage in England and America. As in Germany, the trees became the location for the gifts from St. Nick. And lastly, it's important to recognize that American consumerism essentially jumped on board and began to drive the Christmas train. As the tradition of gift giving grew with the influence of good old St. Nick and Victorian England, merchants were quick to seize a grand opportunity. As they say, the rest is history! Now Christmas for merchants is the defining event of the year. From black Friday to cyber Monday and all the days leading up to December 25, it's all about who can get the consumers money and how much of it. That may sound a little crass, but it's the reality. We're constantly bombarded during the Christmas season with enticements to grab up stuff we don't need and spend much more than we really should in a materialistic binge. We probably know better, but we do it anyway. Now, before you think I'm Ebenezer Scrooge let me say this: I'm a fan of gift giving at Christmas. Planning to buy, selecting, purchasing and giving gifts is a great way to express love and appreciation. When we truly gift a gift from the heart to someone we care about it brings us great joy and hopefully the person to whom we give the gift (if they like it!). And I'm not above saying that I enjoy receiving as well. So here me clearly...I have no problem with the tradition of gift giving at Christmas. However, I do groan a little more each year inwardly as I see the gift that is Christmas being displaced by the tradition of giving gifts to one another. What the world needs is to unwrap the gift that is Christ. When we do this we realize that God's gift to us is the Gospel. However, the Gospel is neither what we wanted nor what we naturally want. We often treat the Gospel with about as much excitement as a ten-year-old boy does a box of underwear and socks on Christmas morning. Who wants to really find out they need a Savior to rescue them from certain divine judgment and who claims Lordship over his or her life? We may not want it, but the gift of the Gospel is what we need. We may not have expected God to relate to us through the Son of God, fully God and fully human, whose mission was to die on a Roman cross, but it is what we must receive. A gift is an act of grace, not something earned. The Gospel is the gift of Christmas. Furthermore, as I receive the Gospel, I must evaluate my response to it. What will be my gift to God in response? A true gift is given willingly from love, not compulsion or guilt. I think we all know the difference. I know how I feel when I give a gift I want to compared to one that I think I have to. I bet you do too! I wonder how often people respond to Christ only from a sense of obligation and tradition rather than genuine affection for Him? When I unwrap the gift of Christmas, I don't find the stuff of consumerism, decorations and merriment, or even family. I find Christ, who is the good news of great joy for the whole world. And if that is what I truly find it gives meaning to the rest, and it challenges me to consider what will be my gift back to Him. My gift can be nothing less than my whole self. All of my life is compelled to come under Jesus' Lordship. I trust Him and place my full faith in Him. And then I ask myself what part of my life may not be appropriately under His Lordship. Is it my finances? Am I stingy? Is it my marriage? Am I attending to it as I should? Is it my tongue? Do I gossip and lack self-control? Is it my pride? Have I lost my sense of dependence on God? Is it my pain? Am I holding on to a grudge? Indeed, Christmas is a time to give. In our culture we give a lot, which is actually a good thing. However, anything that comes to overshadow Christ becomes a bad thing, even the tradition of gift giving during the celebration of His birth. I ask you to consider as you give to many others, what are you giving to Christ?